Why have Conservative MPs been so silent in the controversy around Jagmeet Singh? 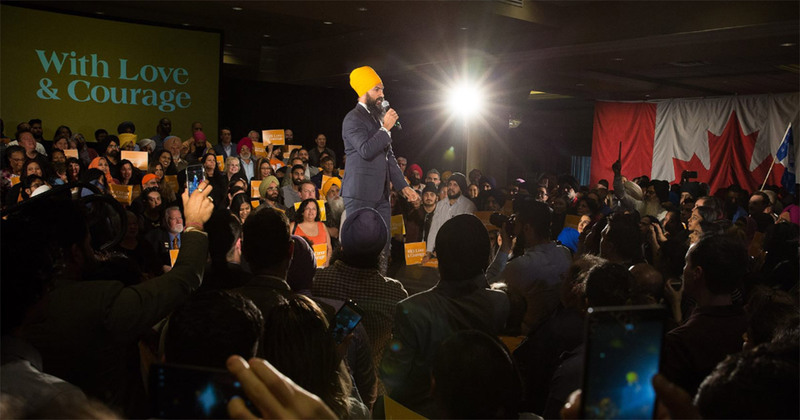 In recent days, as the Canadian media has repeatedly focused on and criticised Jagmeet Singh's meetings with Sikh activists in Britain and Canada, one side has been silent: Canadian Tories. You might expect Conservative MPs not to miss a chance at taking shots at the NDP leader, especially since just a few weeks ago they were prepared to introduce a motion on 'Khalistani extremism'. Now, the motion is nowhere to be seen and Tory MPs have been conspicuously quiet even as Canadian journalists have asked them for their views. Michelle Rempel MP, the outspoken Shadow Minister for Citizenship and Immigration, who earlier endorsed the motion, has avoided even linking to any story on Jagmeet Singh on Twitter account. Barfi Culture contacted Deepak Obhrai MP, who had earlier pushed the motion too. His office said he had made no statement on the recent news stories. When asked for a comment by email, they did not reply back. On social media too, Obhrai has conspicuously avoided linking to any story about Singh. The only sign of criticism came from one Liberal MP, John McKay, who earlier told the Globe and Mail: "Did he [Singh] actually know what he was, in effect, implicitly endorsing?" That was it. Liberal MPs have largely avoided criticising Singh too. "Certainly while some feel that Jagmeet Singh needs to be questioned on these issues, many others feel that recent media coverage is doing damage not only to Jagmeet Singh’s campaign but to the Canadian Sikh community as a whole, affecting our everyday lives," said Dr. Kamal Arora to Barfi Culture. Ms Arora is a Vancouver-based anthropologist whose research focuses on gender and Sikhism. "There has definitely been an awareness that Canadian Sikh voices are often left out of mainstream discussions," she added. Perhaps Conservative MPs realise that piling in on Singh in public would inflame Canadian Sikhs even more. And given the impact that Sikhs can have on many seats across the country, they have deliberately avoided wading in. In sharp contrast, Terry Milewski, a veteran broadcaster at CBC, has constantly framed his views as defending Sikhs against a "tiny minority" of extremists. In other words, he thinks Sikhs are split on the issue. I've said that explicitly about a thousand times, constantly insisting that it's wrong to lump all Sikhs together with a tiny minority of fanatics - which is what the WSO does when it complains that any attack on extremists is an attack on all Sikhs. So take it up with them. But who are the fanatics? All Sikhs who believe in Khalistan? That is rarely made clear. Other commentators such as Candice Malcolm have also said on Twitter they have received a lot of support from Sikhs worried about extremism. But it seems unlikely Tory MPs would be so quiet if Canadian Sikhs were genuinely split on the issue. Sikh groups don't see it that way either. Mukhbir Singh, President of the non-partisan World Sikh Organization, told Barfi Culture: "We expect politicians of all stripes to stand with the Sikh community and reject any notion of Canadian Sikhs falling prey to radicalism." "Those allegations [about Jagmeet Singh] are not supported by the facts or by the ground reality and we believe that our MPs know that very well." That view seems to be supported by some Liberal Sikh MPs, who have not mentioned Jagmeet Singh by name but have hinted at being uncomfortable with recent media coverage. On Monday the Liberal MP Ruby Sahota tweeted that "the majority of Canadian media" had engaged in "one dimensional reporting" of Sikhs. Yesterday, Raj Grewal MP also took a coded swipe at the media with a statement in the House of Commons. He was praised by the MP for Mississauga Gagan Sikand and by Ruby Sahota, who added: "The contribution of Sikh Canadians is significant in building & shaping our country for the better through selfless seva. We deserve to have our voice included in any conversation about the Sikh community & our history in Canada." Perhaps the Tories are more in touch with the feelings of Canadian Sikhs than much of the national media.